(leading to ExpertRating A to Z Grant writing Skills Certification). This course includes a knowledgeable and caring instructor who will guide you through your lessons, facilitate discussions, and answer your questions. The instructor for this course will be Linda Vallejo. About the ExpertRating Online Grant Writing Course instructor : Linda Vallejo is a practicing professional development officer and grant writer with twenty years experience and has taught the A to Z Grant writing System for over seven years. She has developed and implemented successful Grant writing campaigns for multiple non-profit organizations including proposals for education, arts, environment, mental health, medical and community concerns. "A great course! Concise and well-organized. It had the potential to be very confusing, but it wasn't at all. I will definitely recommend it to others." "Dear Linda, just wanted to let you know how much your course has helped us. Our shelter building has needed some major repairs for some time now. With the encouragement of the executive director I recently sent a few grant proposals. Today I got word from a foundation that has approved us for a 20K grant! I could not have done this without the knowledge your course has given me. Thanks again." "Excellent Course! I've taken "on-line" courses before, and this was by far the best one I've taken yet. The lessons were kept to the right length, and the supplemental information provided was very useful." "Excellent course! This was my first on-line course and I thoroughly enjoyed it. I plan on taking other courses." "Fantastic course, very organized and clear. The instructor's suggestions and comments were always right on target. The quizzes and assignments reinforced the lessons, and there's not a thing I would change about the course. Thanks!!" "First, I love this class! I have learned a lot of new approaches and have had a lot of things "reinforced" that I have already been doing correctly. WOW! Linda Vallejo, you are an awesome teacher." "Great class, very informative and I would definitely recommend this class to others." "Great course! I'm sure the knowledge I've gained will prove useful to many non-profit groups I interact with in my community. They, too, will be grateful! THANK YOU!" "I appreciate the invaluable help and advice that Linda has provided me in response to my questions. Thank you very much for all your kind assistance, Linda!" "I appreciate the time the instructor took to answer each and every message sent to the discussion board. This has been a wonderful course and has taught me so very much! After having worked a short while in the world of non-profits, I now understand so much more about the why's and where-for's of how those "businesseses" are run! Thank you for all of the information included in these lessons--my "favorites" page on the internet is full of useful information and leads." "I enjoyed this course. It was very understandable for me and will be extremely useful in that if will help me be more efficient in writing grants for my school." ExpertRating is one of the world's only ISO 9001:2015 Certified companies (from TUV America) offering an Online Grant Writing Course (leading to ExpertRating Grant Writing Skills Certification). When you choose the ExpertRating Online Grant Writing Course you can be sure that you are buying a premium International certification that is recognized by hundreds of employers and Government bodies in the US and other countries. With ExpertRating you get certified quickly online and you are equipped with a store house of information through the in-depth ExpertRating Online Grant Writing Courseware which has been developed by experienced Grant Writing Experts. The ExpertRating Grant writing Certification is by far the best value for money instructor led Grant writing Program at $129.99. How much does the Grant writing Certification cost and what does it include? You can buy this ExpertRating Online Grant Writing Course leading to Grant writing certification at a special offer price of only $129.99 which includes the in-depth ExpertRating Online Grant Writing Courseware and exam fee. This is the best value for money Grant writing Program available till date. You get the following services within the USD $129.99 fee. In-depth ExpertRating Online Grant Writing Courseware including scenarios and case studies. World wide airmail delivery of the hard copy Grant writing Certificate. The Grant writing Certificate can be used to prove your certified status and does not mention the words "online". The process of getting yourself certified is very simple. 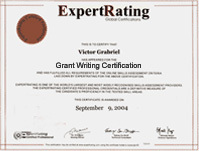 All you have to do is buy the ExpertRating Online Grant Writing Course for $129.99. Log in to the instructor led course using your password. Go through the ExpertRating Online Grant Writing Courseware (which would take you 6 weeks) and complete the final Grant writing Certification exam at your convenience. You can complete the exam within 2 months of buying the Grant writing Certification. The result of the exam appears as soon as it is completed, and your Grant writing Certificate is mailed immediately. Chapter assignments to help you practically use the Grant writing that you will learn during the Grant writing Course. The final exam is fully based upon the ExpertRating Online Grant Writing Courseware that is provided along with the Grant writing Certification. If you have gone through the courseware properly you should not have a problem clearing the exam. 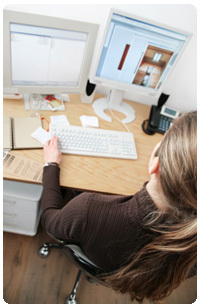 The exam consists of multiple choice questions from all chapters of the ExpertRating Online Grant Writing Courseware. The Grant Writing course will help you write persuasive proposals. Grant writing is the skill of asking for money in the form of a grant from a foundation, organization or a government agency in the form of a document. This document contains information on how the money will be used, by whom will it be used and who will undertake the tasks which are described in the proposal. Grant writing is, however, is, not as easy as it seems. The Grant Writing course will hone your grant writing skills. Grant Writing needs a lot of research and patience. It takes time to make a plan, coordinate the plan, write, and package and submit the grant writing proposal. Persistence is the key to grant writing. The ExpertRating Grant Writing Certification and Course is a valuable course that will teach you the necessary tools and techniques required to enter the field of grant writing. Have you wondered what a grant writer does, what kinds of organizations and causes seek grants, and what types of grants are available? In this lesson, you'll find the answers to your questions, as well as tips for getting into the grant writing field and for finding funders. Many people are often surprised at how much research needs to go into finding a potential funder who is a good match for your program efforts! Finding funders takes a lot of time, effort, and planning, and this lesson will walk you through the information you need to gather and organize. You will gain an invaluable tool here—the Research Information Sheet (RIS)—which will help you keep your research focused and on track. In this lesson, you'll meet three real-world foundation and corporate funders: the Verizon Foundation, Wells Fargo, and the Ben & Jerry's Foundation. This lesson will walk through the application guidelines for each of them, which will help you, get a feel for what to look for in a good match potential funder, how funders present their mission and goals, and what they expect in a complete proposal package. Remember, the more application guidelines you read and study, the better you'll be able to create a successful proposal package. Now that you have a feel for what kinds of information to gather in your search for good match potential funders, you need to know how to effectively organize it. This lesson will begin with a big-picture overview of the grant writing process, so you'll know where your research fits in each step of the way. Then you'll get some proven techniques and tools for organizing an efficient and smooth-running development department. A grant writing campaign means submitting an ongoing calendar of proposals to a wide variety of potential funders, and an organized office is the only way to accomplish this goal! Developing community relationships is crucial to finding support for any worthy cause. So this lesson will look at some creative how-tos of networking with community members, VIPs, and corporate, foundation, and government representatives to help you find contacts and support in your community. Then this lesson will lay the groundwork for making that crucial initial contact with a potential funder. This might be a bit nerve-racking at first, but with the proper preparation, it can be extremely rewarding. Research, relationship-building, phone contacts, organizing—does it all rest on the shoulders of one grant writer? Happily, the answer is no! In this lesson you'll meet the development team members who implement the grant writing campaign and get some ideas for how to put a team of your own together. You'll also get acquainted with the collaborative partners who work side by side with you and your organization, and you'll discover how to put together a successful site visit. It's so important to know how to present yourself, your organization, and your proposed program effectively. So this lesson will explore the elements of two all-important letters: the letter of inquiry and the letter of request. Most funders will want either one or both of these letters, so knowing how to write them is essential. You'll also learn how to ask for the right grant amount and how to overcome any fears you may have about asking for support. You'd be amazed at how many organizations go about their grant writing campaigns backwards! To spare you a great amount of extra work, stress, and unnecessary discouragement, this lesson will walk through a vital technique: the Rollover Concept. This lesson will also begin a detailed exploration of the elements of a Gold Medal Proposal Package, including your organization's history and background, mission statement, goals, major accomplishments, and many other documents and materials that potential funders require. Picking up where you were left off in Lesson 8, in this lesson you'll see how to write your need statement, proposed program paragraphs, measurable objectives, timeline, and evaluation plan. You'll also get a good idea of what kinds of financial documents and materials funders expect in complete proposal packages, including your organization projected income and expense budget, audited financial statement, proposed program budget and request, and future funding paragraphs. What happens to your proposal after you apply for a grant? If you've ever wondered about this, in this lesson you'll discover all the hoops it goes through once it reaches the program officer's desk. If your application should be declined, you'll see how to turn that into an opportunity for future success. And if your proposal should be accepted, you'll learn about the essential thank-you letter, how to put together the final report, and how to acknowledge and provide benefits to the funders supporting your program efforts. You'll also understand how crucial it is to diversify your funding base! In this lesson you'll learn about the A to Z of creating business (for-profit) and individual artist proposal packages. You'll also get some important tips and techniques for putting together proposals for government funding sources, which, as you can imagine, will be more complicated and much lengthier than proposals to foundations, corporations, or individual donors. In this last lesson you'll learn about the importance of presentation when it comes to your proposal package. And you'll also gain some insights into what your board of directors can do for you regarding fund raising, as well as get some ideas about how to get them motivated to do it!